In a landmark Judgment Supreme Court of India convicted VK Sasikala, Ilavarasi and Sudhakaran in the disproportionate assets Case. The Division Bench of Justices PC Ghose and Amitava Roy has restored the conviction and sentence imposed by the trial Court in the disproportionate assets Case. The Supreme Court in Vivek Singh vs. Romani Singh, held that assessment that which of the either parent is better suited to have the custody of the child can be done only after level playing field is granted to both parents. The Supreme Court on Friday held that negligence, unless gross on part of an advocate, would not amount to professional misconduct. The division bench was considering a plea filed by a Kerala lawyer against the order passed by the disciplinary committee of the Bar Council of whereby, it found him guilty of gross negligence in discharge of his professional service to the client and accordingly, imposed the punishment of reprimand with a further stipulation that he shall pay a sum of Rs.5,000 to the Bar Council of India and an equivalent amount to the complainant within two weeks’ time from the date of receipt of the order, failing which he would stand suspended from practising for a period of six months. The Supreme Court in MehmoodaGulshanVs. JavaidHussainMungloo, held that the requirement of the landlord for his own occupation could also mean occupation by a member of the family and mere non-examination of the family member, who intends to do the business, cannot be taken as a ground for repelling the reasonable requirement of the landlord. A three-judge bench of the Apex Court, on reference from a two-judge bench, in the matter of medical students whose admissions were cancelled as Vyapam scam fallout, agreed with the view expressed by Justice Abhay Manohar Sapre and held that it would not be proper to legitimise the admission of the appellants, to MBBS course, in exercise of the jurisdiction vested on it under Article 142 of the Constitution. The Supreme Court in Munshi Lal vs. Smt. Santosh observed that if a tenant enters into a partnership agreement with his son-in-law and allows him to occupy the tenanted premises, without obtaining the consent of the landlord, it cannot be said that there is no parting of possession. The Supreme Court on Wednesday ordered the transfer of Mohammad Shahabuddin from Siwan Jail, district Siwan in Bihar, to Tihar Jail, Delhi. The apex court also ordered that pending trials shall be conducted by video conferencing by the trial court concerned. The Supreme Court turned down a Pakistani national’s plea for extension of visa as “the issue is in the domain of Executive and court cannot interfere in it”. The Supreme Court on Tuesday clarified that one need not or no one can be compelled to stand up in attention position if the national anthem is played in a movie or a documentary. 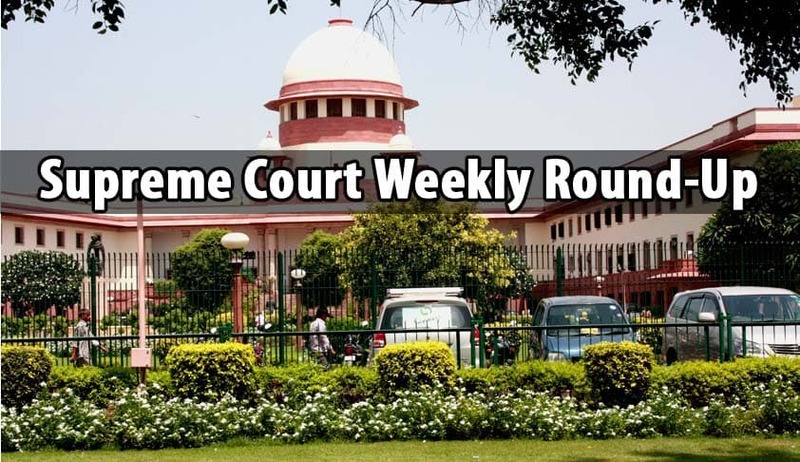 The Supreme Court’s four Judges bench comprising the Chief Justice, J.S.Khehar, and justices Dipak Misra, J.Chelameswar, and Ranjan Gogoi, on Friday dismissed the Central Government’s last legal remedy of Curative Petition in seeking the reversal of the Court’s landmark judgment in ShatrughanChauan v Union of India. The Supreme Court asked the Centre to frame a uniform national policy to deal with those suffering from mental illness and their release from hospitals after being cured saying the issue figured in the concurrent list of the Constitution and hence the union government also has the authority to frame norms. Supreme Court questioned the Centre’s refusal to allow private FM stations and community radio service operators to air news and current affairs programme. The bench on Wednesday, asked the government to consider permitting them to broadcast news and current affairs programme based on the information already available in public domain. In a significant move, after hearing the matter for more than five months, a two judge bench of the Supreme Court on Wednesday referred to a constitution bench all petitions pertaining to power tussle between Delhi’s Arvind Kejriwal government and the Centre. Supreme Court said it would decide issues pertaining to legal aspects of the practices of triple talaq, ‘nikahhalala’ and polygamy among Muslims and would not deal with the question whether divorce under Muslim law needs to be supervised by courts as it falls under the legislative domain. A seven judge bench headed by Chief Justice J S Khehar deferred the hearing of the contempt case against Calcutta High Court judge Justice C S Karnan after he failed to appear.